The Department of Justice has appealed the ruling of a Nevada judge who dismissed the department’s case against Cliven Bundy et al. on the grounds of prosecutorial misconduct, evidently intent on seeing the land-rights protesters jailed. This development made AFP’s front page in the issue just released and now available online. Former federal prosecutor Larry Klayman, founder of Judicial Watch and Freedom Watch, issued a press release earlier in August on behalf of his client, Cliven Bundy, vowing to fight a Department of Justice appeal of a judge’s dismissal of the case against Bundy for his role in the spring 2014 protest against federal land tyranny in Nevada. 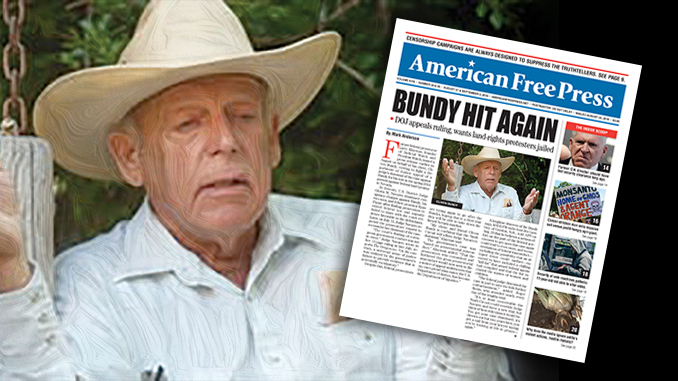 In January, U.S. District Judge Gloria M. Navarro dismissed conspiracy charges against Bundy, his two sons, and fellow protestor Ryan Payne after finding prosecutors violated federal law and unjustly failed to share with the court evidence favorable to the defendants. Later, on July 31, Judge Navarro rejected the prosecutors’ request to reconsider her dismissal of the case.